Summary: Ingrid Yung’s life is full of firsts. A first-generation Chinese American, the first lawyer in her family, she’s about to collect the holy grail of "firsts" and become the first minority woman to make partner at the venerable old law firm Parsons Valentine & Hunt. Ingrid has perfected the art of "passing" and seamlessly blends into the old-boy corporate culture. She gamely banters in the corporate cafeteria, plays in the firm softball league, and earnestly racks up her billable hours. But when an offensive incident at the summer outing threatens the firm’s reputation, Ingrid’s outsider status is suddenly thrown into sharp relief. Scrambling to do damage control, Parsons Valentine announces a new Diversity and Inclusion Initiative, commanding Ingrid to spearhead the effort. Only she’s about to close an enormous transaction that was to be her final step in securing partnership. 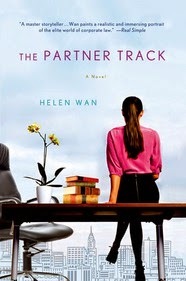 THE PARTNER TRACK by Helen Wan is now available in paperback -- isn't the cover gorgeous? This novel follows Ingrid Yung, a young lawyer at a renowned NYC law firm who must play games with the “old-boys network” to become partner. When an incident at the summer outing, Helen finds herself at odds with her colleagues, including her golden-boy boyfriend, and must choose between becoming a partner and doing the right thing. I can't wait to read this book -- it sounds terrific, but in the meantime, I have a copy of THE PARTNER TRACK, courtesy of the publisher, to share with one lucky reader. To enter, just fill out the form below before September 25th at 11:59 p.m. EST. I will randomly select and notify the winner the following day. This contest is open to those of you with U.S. addresses only. Good luck! Sounds like she has a decision to make! Thanks for the chance to win! This sounds terrific - thanks for the giveaway! OOH! This does sound good!